If your new to Card Making and would like to come along, please join us next month on the 24th of February as a guest, and pick up some top tips and ideas, we look forward to meeting you. Well lots of you wanted to see what I have planned for my Workshop on the 6th of February, so here are the 3 cards we will make on the day, but don't forget there is also the suprise card, which I'm keeping a Suprise. 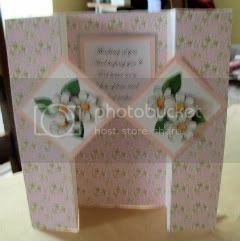 With a pop-up insert, this really is a very pretty card and the images are so cute. 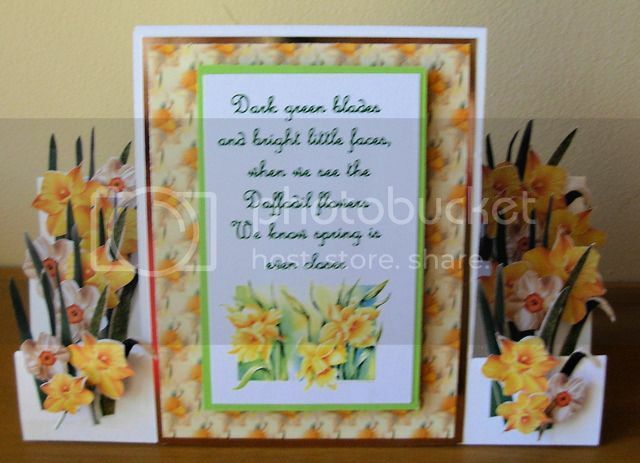 Daffodil Delight Stepper card, this card would make a beautiful Easter card, or Spring Birthday Card, So you will have a choice of 2 inserts. There are still a few places for this workshop, Scroll down page for full detail futher. We welcome new members so if you have just started card making and want some top tips, come along on the evening as a guest, and if you like what you find you can become a member, Email me Here if you would like a visitors pass. I have my first Workshop for 2010 on the 6th of February in St Patrick's Hall, more details below. As the Crafts 4 U Event in Abbeyleix has had to be cancelled I have decided to have a Workshop for the ladies who were disappointed that the weekend wont go ahead. My workshops are open to all crafters everyone very is welcome. You will need to bring a tool kit of 2 x Scissors, Craft knife, Craft mat, a paper trimmer, Tweezers, Doublesided tape, Foam tape, Decoupage Foam pads, A good quality paper glue, and Peel-off boarders and corners. Biscuits and Homemade Cakes Supplied all day. Extra Surprise kit to make at home with full instructions, which I will demonstrate at the end of the last class. There are still a few places available if you fancy coming along. Please email me HERE for full details and to book a place and I will send you full details and directions for St Patrick's Hall. If you have problems with the new email address you can phone me at home 01 2010117 between 10.00am and 5.00pm Mon to Fri.
Well done!! looking forward to meeting your new bundle of joy. As the Crafts 4 U Event in Abbeyleix has had to be cancelled I have decided to have a Workshop for the ladies who were dissapointed that the weekend wont go ahead. My new email address is HERE if you need to contact me. My old email account was corrupted with a virus so I have lost every contact that I had saved, please email me HERE so that I can add you to my mailing list. Hi Everone, well the snow we were to have yesterday didn't arrive so we are having a nice thaw, and all the ice has gone, making it a lot easier getting about, so This Wednesday I am having a craft day in my home for the club members who very kindly helped me make the card kits and finish off the cards by adding greetings and inserts for the Blackrock Hospice Charity Fun Day last July, so looking forward to seeing you on Wednesday morning for a fun day of card making and a lovely lunch.